New Options for Orthopedic Surgery and Cruciate Ligament Repair At Sault Ste. Marie Animal Clinic! Dr. Palmer has always loved surgery and after 29 years in practice, he has done quite a few surgeries on dogs and cats. He is also an avid woodworker, and as such, he has always been particularly interested in orthopedic (bone and joint surgery) – which just like woodworking, requires precision, finesse and the use of a combination of (specialized) hand and power tools. 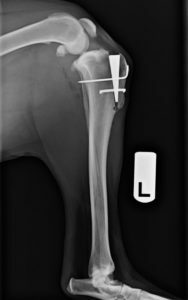 In April 2018, Dr. Palmer attended a course in Chicago to learn some new and improved techniques using new and improved tools by Orthomed Veterinary Orthopedics. 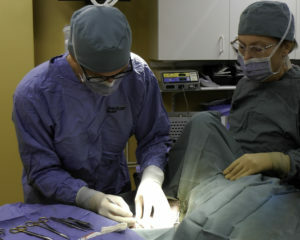 Since then, he has had the opportunity to perform numerous orthopedic procedures using the new equipment and techniques and has been very pleased with the results. Just like people, dogs are prone to torn cruciate ligaments – an important ligament in the knee. Also, like people, a dog with a torn cruciate ligament can be at risk for pain and significant arthritis if the knee joint is not surgically stabilized. Orthomed, a company from the UK, has pioneered a technique that involves implanting a titanium foam wedge to stabilize the joint. This is a particularly good choice for larger dogs that in the past we would have had to refer to a veterinary orthopedic surgeon in Southern Ontario or Lansing, Michigan. Dogs can experience patellar luxation – where the knee cap or patella ‘pops’ into and out of place on either the inside (medial) or outside (lateral) of the knee. Over time, this too can lead to degenerative joint disease and arthritis. Orthomed has pioneered a new technique that involves anchoring a specialized implant that acts as a ridge to keep the knee cap in its proper position. 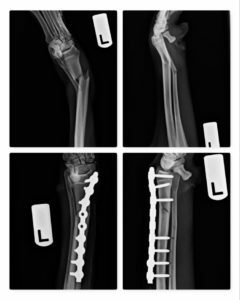 Once again, like people, some broken bones in dogs and cats will heal much better and faster if they are stabilized with surgery instead of a cast. Some fractures can not be casted at all. While different techniques and tools can be used such as pins and wires, a plate with screws is often the treatment of choice. Orthomed has developed a unique plating system that allows for the plate to be fitted exactly to the bone by being able to bend and/or shorten it. All patients undergoing cruciate repair or orthopedic surgery of the hind legs at Sault Ste. Marie Animal Clinic will be given an epidural for extra pain control (or equivalent medication if a front leg procedure) and will given liberal pain control medication throughout their stay and convalescence. Their comfort is our top priority.